Stunning growth in food and beverage delivery services opens more opportunities for app-related services. The reason why China’s startup ecosystem is so comprehensive and vibrant, is that it’s comprised of so many vibrant sectors – from AI, IOT and big data on the pure technology end to mobile payment, O2O and new retail on the other end of spectrum. And according to a recent Analysys China report, China’s internet-enabled lifestyle and on-demand service industry is apparently one of the brightest out of all the sectors. The Beijing-based internet market researcher said that Chinese online-to-offline lifestyle service has enjoyed phenomenal growth of 892% every half year since 2014. With continued innovation blurring the lines between advanced technology and traditional industries, the future prospect of this space continues to be glowing. While local living service covers a wide range from local dining, lodging, movies to community and marriage services, food delivery is an important source of traffic entrance of the industry’s ecosystem which is growing rapidly, taking up to 26% of 020 service life market and 85% of home market. A direct comparison in different types of app services shows that ‘Food Takeaway’ is where consumers are willing to spend more, reflecting higher purchasing power. This trend is also enhanced with greater clarity with Analysys data demonstrating the all-dominating ‘Food Takeaway’ as a key purpose of active app users in the first half 2017. 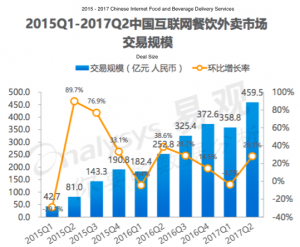 A 976.11% overall growth rate over 12 quarters from 2015 to 2017 in deal size depict the rise of the Chinese Internet Takeaway Food & Beverage Market. Breaking it down further to China’s demographics, we can consider the gender and age of mobile app users. There is a higher proportion of woman users, compared to man. Young working adults from 24-30 age group seemed to be the largest proportion of the app. The lowest proportion of life service app users belong to the age group before ’24-30’ and ’31-35’ – perhaps suggesting level of disposable income could be a factor affecting the behavior of consumers. With a higher proportion of female app users, we can look at whether more number of users translate necessarily to greater expenditure for food and beverage takeaways. According to the data cited, woman app users use the app more frequently and also spend more than man. It is interesting that both genders’ top app usage – Ele.me, signifying a stable growing market, as apps become more common among other cities in China. Local living app services has taken China by storm – mainly driven by food and beverage delivery. Innovative solutions in the food delivery space in China can be expected, given the huge traffic and data that can be generated in the midst of extensive artificial intelligence and data driven research driven by e-commerce giants. It is also noteworthy to consider rising affluence of woman and their potential influence.